Nina sways precariously on a platform, faithfully reciting Konstantin's awkward prose. A crowd of friends noisily distribute sweets, with every rustle tearing through the director’s tense frame. It is a clever opening that captures the essence of Chekhov’s ‘The Seagull’, which sees a young writer struggle to make his voice heard in a community of self-serving artists. 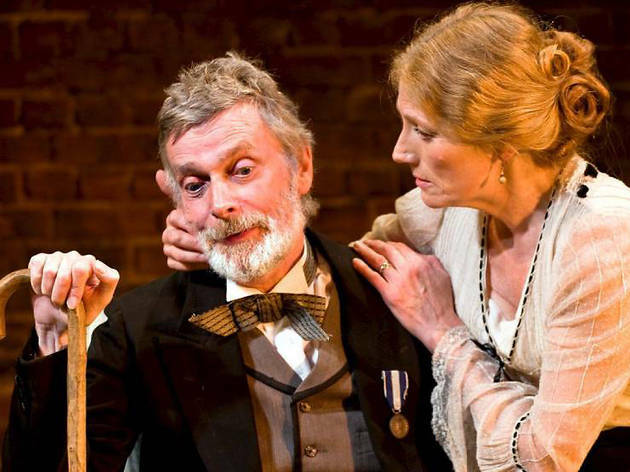 Al Weaver plays the tortured Konstantin, whom Nina (Yolanda Kettle, making her real stage debut too) drops in favour of famous writer Trigorin. Weaver makes Konstantin as flinty as Nina is fickle. It is his allies that shine in this sympathetic ‘Seagull’. Roger Lloyd Pack’s straight-talking doctor radiates the assurance of a life well lived and Will Knightley’s Sorin creaks with kindness. Director Joseph Blatchley is careful to avoid melodrama and Dora Schweitzer’s set is fittingly restrained. There are no sweeping, shadowy interiors and Charlotte Pyke’s new translation of the play unfurls in a modest outdoor landscape, papered in green. But Blatchley’s decision to mute any extravagant elements does diminish some blazing roles. Trigorin (Matt Wilkinson) is suitably weedy but he lacks charisma and it’s tough to see why the ladies flock to him. 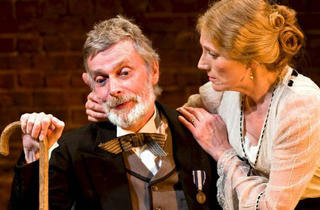 Geraldine James’s Arkadina has an earthy appeal but even her most cutting lines are softened with apologetic smiles.